More integration contents planned to be released for S4,Ariba, SF, Concur etc. HCP-IS being planned to be made available in other DC’s too where HCP is being made available. The integration content is planned to have a major revamp. It appeared to me that UX is getting aligned with some of the Fiori 2.0 concepts. Integration content is going to be more open. Tighter integration of HCP Integration service, HCP-ODP. Google acquires Apigee. This has no impact on SAP API Management solution. 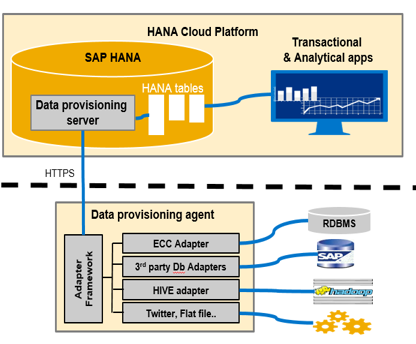 SAP HANA smart data integration delivers built-in data movement capabilities into the HANA database to ingest data from a wide variety of sources, as well as move data out (bi-directionally). If you already have SLT/BODS/3rd party tools, you could possibly continue using them to replicate data into HANA on HCP. SDI is the recommended tool when moving data into HANA. Address Verification is a micro service built using SDQ and is currently available as beta in HCP. Another interesting service which I came across was Agile Data preparation. This is a SaaS available on HCP to perform data cleansing. It offers a simple SAPUI5 based user interface to obtain data form various source, work with the data and prepare data sets with a visual, interactive interface and finally share it via excel or persist the data back into HANA. It’s a great service for business analysts as it is very simple to use. 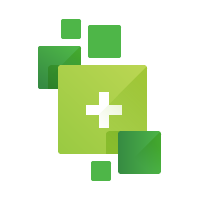 HCP Enterprise Messaging service is available as beta. What does it offer? Support high volume, high-speed communication between devices, applications, and systems. Provide reliable data transmission for mission critical scenarios to ensure guaranteed message delivery. Handle peak loads (for example, rush hour). Support open protocols for effective decoupling of devices and applications. Support seamless connectivity to enterprise systems using standard communication patterns. Accepts MQTT/REST calls and converts them into JMS which the messaging backend understands. 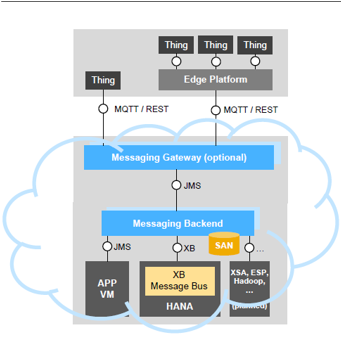 During Bjoern’s keynote, he demonstrated a mobile app which sends messages to HCP HANA DB via this messaging services (using both MQTT/REST protocols). SAP’s Vehicle insight application also uses this service. UX Prototyping tool BUILD has been made generally available. You can now prototype your applications much collaboratively using BUILD and seamlessly integrate them with SAP WebIDE for developers to continue building the app. Web IDE (personal edition) supports offline development. You can use it for evaluation purpose or Productive purposes. Important to note that certain features like plugin/template development, consumption of optional plugins, and cloud specific features like collaboration support are not available in the personal edition. You can now create SAP GUI for HTML and WebDynpro Apps in the Portal service. With the release of SAPUI 1.40, the Fiori Launchpad will soon be enriched with SAP Fiori 2.0 concepts like Me Area, App finder, Belize design theme etc. Predefined content for SAP S/4HANA Finance. This will be available sometime soon, where key Finance apps will be made available in HCP as part of Fiori Cloud Edition. This is one of the most awaited service. This is planned to be available as beta in few months’ time. Using the workflow service, you can now orchestrate a sequence of tasks across different people and organizations. This service can be used to encapsulate business logic from application logic, enabling business and key users to change the decision logic without re-writing the application. Think of it as BRF+ in the cloud. There are decision tables which can be updated by business users. 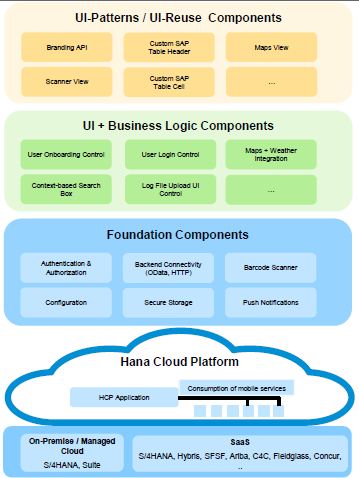 As of today, SAP HANA Cloud Platform, starter edition for Cloud Foundry Services (beta) is available to try out Cloud Foundry. There was no announcement as to when Cloud Foundry will be generally available. SAP IoT Applications are driving the next set of innovations. Bjoern also showcased an IoT application service, which was built on cloud foundry. Using the new IoT application service, we can now model thing types/things, onboard the devices and use SAP WebIDE to create IoT applications. The IoT application services are based on Microservices in cloud foundry and help to efficiently model your things and connect them to HCP. SAP is changing the way its shipping innovation to customers. Previously, to obtain a new feature, we used to apply support packs to our backend system. 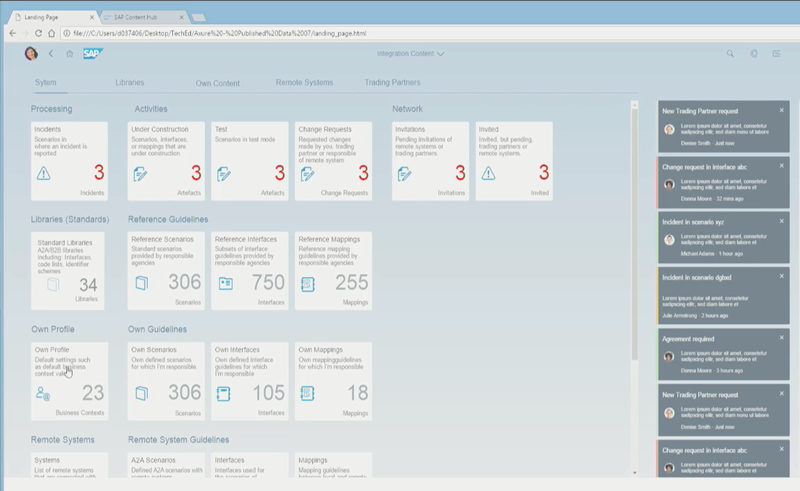 With HCP, SAP is delivering the UX layer which interacts with your S4HANA backend system. The example below shows SAP RealSpend application which provides functionality for managers to make decision with regards to budgets and expenses. What even excites me more is the availability of RealSpend APIs which can be directly consumed by other applications and services. Since this application sits on HCP, it will have regular updates with new features and functionalities. You can now use CTS+ as a central (on-premise) tool to control the content that gets deployed in the different SAP HCP accounts. It enables synchronized transport in hybrid scenarios (e.g. on-premise ABAP content together with SAP HCP content). You would need to create a multi-target application (MTA) which references your java/HTML5 application and manually this to your ABAP transport in DEV environment. From the DEV landscape, the application can progress through to PROD landscape using the normal ABAP transport mechanism. 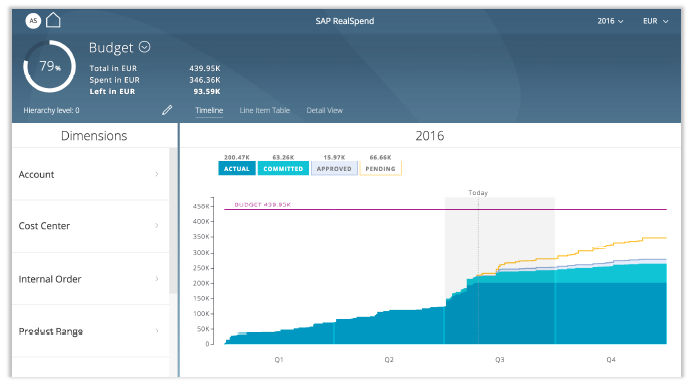 SAP Content to Go, will be a wallet-style application to hold your important business data. This is a great way to get your S4HANA business data on your mobile device even without having to build an App. In very simple terms, the users will navigate to their Fiori App and when inside either Object pages/Overview pages, they can click on a button to send the data to the mobile App. 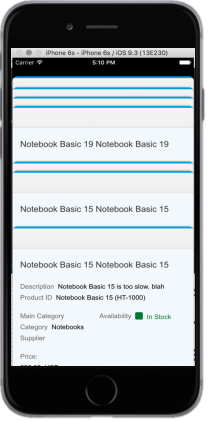 These objects (customer details or a purchase order) will be available in the SAP Content to Go mobile app and will display data in real time. It can also work in offline mode. The name of this app will probably change and it will be only available in iPhone Apps to start with. It requires HCP Mobile services and will be part of it. There has been lot of talks around SAP and Apple partnership. I managed to have a brief conversation with the staffs who were in the Fiori iOS booth. There is already an iOS SDK available on HCP. What value does this partnership bring to us? Why a new SDK for iOS ? There is already a beta program for customers to participate and provide feedback. The plan is to make the iOS SDK along with few Apps generally available early next year. Lot of renames happening in this space too. SAP Cloud Identity has been renamed to HCP Identity authentication. As you can see in the below image, there are three services in the cloud which manage users, access and compliance. SAP Cloud Identity Access Governance, access analysis service is something similar to the on-premise GRC solution where we can perform Segregation of Duties (SoD). The new member in the family is HCP, Identity Provisioning service (which is now generally available). Overall, I came back home with lot of information hard to digest in a week. 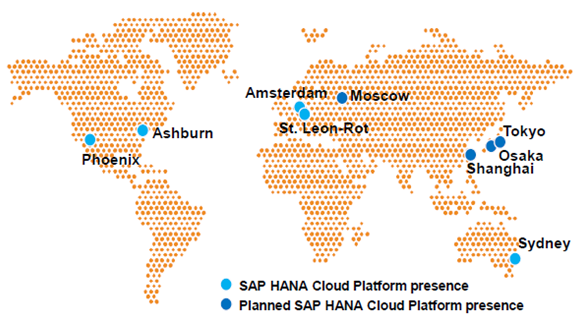 HANA Cloud Platform is the centerpiece of SAP’s strategy and there is going to me more and more services and features added in the next few months. Thanks Moya. I was just trying to be modest. Feature of “mobile cloud” within WebIDE is available now? not on trial instance? Thanks. Yes, just saw the announcement on Cloud Build Service.